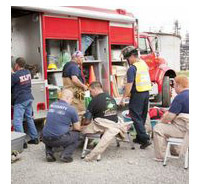 As more and more homeland security grant programs begin to require extensive training and exercise programs as eligibility criteria, many communities are looking for ways to collaborate with their preparedness partners to participate in the required number of exercises. Hancock County, West Virginia is no exception. The county’s Local Emergency Planning Committee facilitated the design and completion of a full-scale exercise for community response agencies (police, fire, and EMS) as well as the county’s public health department. As the design progressed, a number of private sector industrial organizations and other regional public health agencies expressed an interest in playing in the exercise. We designed a three-phase scenario starting with a flu clinic at the plant, then progressing to a security breach, and concluding with a large fire intentionally started during the security incident. The result was a full day of exercising that met the training needs for 18 agencies (with nearly 100 participants). Not only was the exercise designed in accordance with the Homeland Security Exercise and Evaluation Program, but it was also done consistently with USEPA, US Coast Guard and Maritime Security requirements.